The New York Blood Center has abandoned a colony of 66 chimps in Liberia that its research teams used in experiments for three decades, reports James Gorman of the New York Times in a story today. The burden of their survival and care has now been foisted on The HSUS and other caring groups and individuals who are picking up the pieces in a distant and beleaguered nation gripped in recent months by the Ebola crisis. It is a story of past exploitation and present-day heartlessness by a well-funded charity with ample resources to handle a responsibility it created and cannot now abandon. Since the Blood Center cut off funds on Mar. 6, The HSUS and the Arcus Foundation have been providing support to keep the chimps alive. Dozens of volunteers in Liberia and neighboring countries have answered the call, putting their lives at risk to help the chimps. The crisis began a few months ago when a former chimpanzee caregiver sounded the alarm: the Blood Center was terminating all funding for the care of the chimps it used for decades in medical research for its financial benefit. A team of US researchers on the ground in Liberia helping humans during the Ebola crisis stepped in to make sure that the chimpanzees, including several infants, didn't die from dehydration or starvation. The HSUS was alerted in mid-March and has been working since with a small group of dedicated individuals to respond. The HSUS, along with Humane Society International, has sent emergency funding to pay for food and water for the animals who live on six islands and are entirely dependent on human care. There is a long history behind these individuals who have endured so much. In the mid-1970s, the Blood Center captured some of them from the wild, obtained others from pet owners, and set out to use them for research involving the hepatitis B vaccine and blood cleansing, among other topics. These hapless creatures have also endured and survived protracted civil war in the country - going weeks at a time without food or water. Many died from dehydration and starvation or were killed by rogue militias. Time after time caregivers risked their lives to go out to the islands to feed the chimpanzees, at times attracting fire from the militant bands. So, this story is not just about the chimpanzees, but also about the caregivers who have sacrificed so much and have been volunteering to take care of the animals since the Blood Center left them in peril. It is simply shocking that the Blood Center chose to deliver this blow during the largest Ebola outbreak in history, a calamity from which the government of Liberia is reeling - adding a burden to a nation strapped with a human crisis of immense proportions. 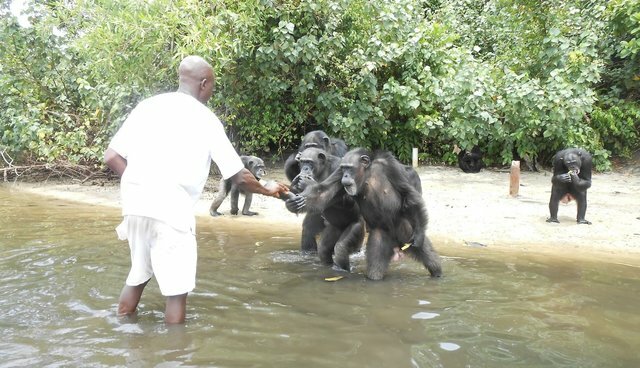 The Blood Center previously committed itself to the lifetime care of these chimpanzees, its officials publicly announcing their ethical responsibility to do so and indicating the start of an endowment for this purpose a decade ago. Officials there are now repudiating this commitment, stating heartlessly that the organization "never had any obligation for care for the chimps, contractual or otherwise." The HSUS hired Agnes Souchal, an expert from the Sanaga-Yong chimpanzee sanctuary in Cameroon, to conduct an assessment on the ground. Agnes worked with the caregivers over two weeks, including to repair the water system for five of the six islands. Prior to this repair, chimpanzees were handed cups of water by the caregivers every other day. She implemented changes in their diet, introducing the animals to new foods for the first time, documented on this video. There are plans underway to increase feedings to at least once a day, including arrangements for purchase of a boat engine to do so. We are so thankful that the Arcus Foundation has committed emergency funding to help - Arcus has been a key player in stepping in whenever and wherever great apes are in peril. But we need everyone's help to make these changes. Please let New York Blood Center officials know that they need to make a financial obligation to secure the chimpanzees' future. I will continue to update my readers as this real-time drama unfolds. P. S. I'm delighted to announce that hundreds of compassionate people like you have stepped up in the last few hours to support our new crowdfunding effort to provide for these chimps. Since the Times' article published this morning, almost 200 people have already committed over $10,000 to support the chimps' immediate needs. Please join them by donating here.